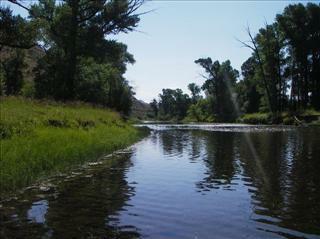 Description: A 3/4 mile of the White River which includes a 2-acre pond. This property is great for the whole family. Mom and dad can enjoy the river and the kids can work the pond. The river offers excellent freestone angling. This 40- to 50-foot wide section flows swiftly through a lovely cottonwood, oakbrush and juniper-forested canyon. Location: From the town of Meeker travel northeast towards Trapper's Lake on CR 8 approximately 15 miles. Capacity: 3 anglers per day but not more than 12 anglers per week.